Take several warm-up swings to get use to the extra weight of the bat and the timing of the bat impact. Now align yourself to the plate and take full swings. Focus your attention on your swing as if you are trying to hit an imaginary ball with full force. Listen to the location of the impact and the auditory sound, paying attention to where the impact occurs with respect to home plate and feet position. Common swing flaws, dropping the back shoulder, early arm extension - casting, and other pre swing habits such as bat wagging, will cause the impact to be delivered in a non-optimal situation. 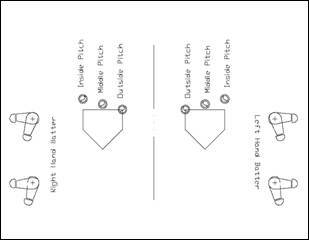 A proper swing will result when the impact occurs in front of the batter’s front foot (reference pitch locations below). Place the ball approximately belt high. Hit several balls (vary ball location if tee permits for additional practice). The correct swing will result when the sliding weight impacts the end of the bat at the same time the bat impacts the ball. The point of impact (feel, impact, and sound) will determine if the swing resulted in a correct swing. The hitter is encouraged to keep practicing until adjustments in hitters swing results in the correct swing mechanic. Common swing flaws; dropping the back shoulder, early arm extension - casting, and other pre-swing habits such as bat wagging will cause improper ball-bat impact. Each of these swing flaws will decrease bat speed resulting in less power at contact. When you have achieved the correct swing, no matter what the ball position, the impact should occur at the point of bat-ball impact in front of the hitter’s front foot (reference pitch locations below). Once you become familiar with the DeepImpactXP you can also try hitting a regulation ball that is soft tossed by another person (person on one knee directly to the side of the hitter). Soft vertical tosses to the various hitting positions (inside, middle, and outside tosses along with varying ball height) will provide for maximum training benefit. Align your front foot with the front of the plate if a plate is available. The correct swing will result when the sliding weight impacts the end of the bat at the same time the bat impacts the ball. The point of impact (feel, impact, and sound) will determine if the swing resulted in a correct swing, or flawed swing. The hitter is encouraged to keep practicing until adjustments are made resulting in a correct swing. Common swing flaws; dropping your back shoulder, early arm extensions - casting, and other pre swing habits such as bat wagging, will cause the impact to be delivered in a non-optimal situation. Each of these swing flaws will decrease bat speed resulting in less power at contact. Soft-toss hitting provides the closest real live pitch simulation, because the person tossing the ball can vary the toss to represent numerous pitch locations (reference pitch locations below).